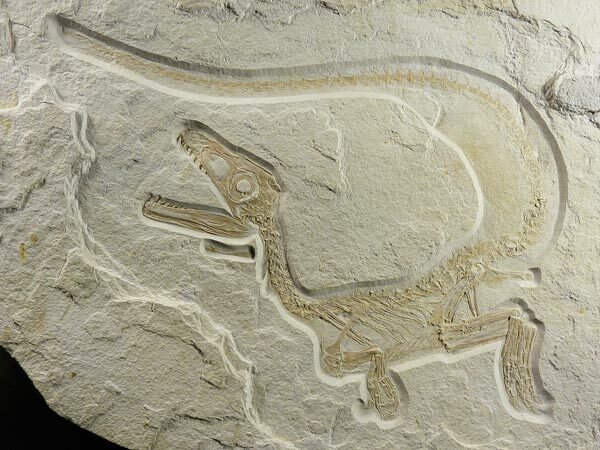 The skeleton of a bushy-tailed baby dinosaur that roamed Earth 135 million years ago has been found in Europe. The creature had little 'fuzzy' feathers, almost like hairs. Named Sciurumimus after the tree squirrel species Sciurus, it is the best preserved dinosaur remains ever discovered in Europe. At just 72 cms (28 inches) long, the fanged predator looks like a tiny T-Rex. It is believed to have been a year-old hatchling and had a large skull, short hind limbs and smooth skin. Its vivid compression with mouth wide open also bears the outline of sharp, serrated little teeth and primitive fuzzy feathers that are more akin to hair. These were over its front, below the belly, and back as well as the tail, suggesting the animal's whole body could have been covered in feathers. It is impossible to say exactly what killed the animal, but it has been speculated that it may have drowned. Previously reported fossils of feathered killer dinosaurs belonged to a group called coelurosaurs that are closely related to birds and from which T Rex and other meat-eating beasts evolved. But Sciurumimus albersdoerferi - dug up out of limestone rock at a quarry near Kelheim in Bavaria, southern Germany, in 2009 - was a megalosauroid which were members of the theropods. Fossils of theropods - which include T Rex - are rare and usually fragmented. The best T Rex specimens are about 80 percent preserved whereas Sciurumimus is about 98 percent intact. Dr Rauhut, curator of the Bavarian Paleontological and Geological Collections (BSPG) in Munich, led an international team that examined the animal. The large size of the skull in proportion to the rest of the body was a sure sign it had been very young when it died, he said. Examinations of juvenile theropods can help shed light on the mechanisms of evolution because recent research indicates changes in the processes of growing played an important role in how creatures evolved. The bones of the theropod are even better preserved than those of feathered dinosaurs found in China in the 1990s. Those are the only ones which are similarly complete, but they are millions of years younger, saud the researchers whose findings are published in Proceedings of the National Academy of Sciences. Hair on dinosaurs has been a focus of research because it could have developed into the feathers that were first detected on fossils of Archaeopteryx, the oldest known bird, which were found in Germany in the 19th century. That discovery suggested dinosaurs may have evolved into birds.